New America Media – California’s Prop. 47 allows many individuals to change certain felonies into misdemeanors on their criminal records – but less than a quarter of those eligible have submitted their requests, and the window of opportunity could expire next year. Eighteen months into Prop. 47’s enactment, the state has received some 211,000 petitions seeking resentencing or a record change. The ballot measure, which passed in November 2014 despite heavy opposition from law enforcement associations, gives a three-year window for the estimated 1 million eligible individuals to file for relief. Prop. 47 converted certain nonviolent felonies into misdemeanors, which translates into little or no jail time for crimes like low-value theft and simple drug possession. The savings generated by the measure are meant to guide people into programs such as drug treatment. Advocates worry that because the “application process is so complex” – even though the application itself is only a page long – and counties don’t have enough attorneys who can spend adequate time dealing with petitions, the sun may set on the window before all those eligible can apply. However, in early June, California State Assembly approved AB 2765, a bill that would extend the deadline by five years, from November 2017 to November 2022. The Senate Public Safety Committee unanimously approved the measure June 28, moving it to the Senate Committee on Appropriations where it will be heard on Aug. 1. If it is signed into law, “it will give the courts and the judicial system more time to process the applications,” says Marisa Arrona, Prop. 47 implementation director with Californians for Safety and Justice, the non-profit that was at the forefront of the Prop. 47 campaign. Equally importantly, it will give more time for criminal justice advocates to conduct outreach and get more people to submit their requests. Prop. 47 supporters say that processing petitions is burdensome for the public defenders’ offices that deal with the cases. And resentencing takes “some coordination,” says Contra Costa County Public Defender Robin Lipetzky. Since the measure is retroactive, and there is no limit on how far back a conviction can go, some rap sheets could go back several decades. The biggest problem, however, is “there’s no sustained funding for the legal services that help eligible individuals file for Prop. 47 relief,” says Eliza Hersh, director of Clean Slate, a project of the East Bay Community Law Center. In Alameda County, for instance, the Public Defender’s office got no funding at all to take up Prop. 47 cases. Hersh says that Public Defender Brendon Wood assigned an attorney from his staff to deal with Prop. 47 cases full-time, with no additional funding for the increased work. Contra Costa County also faced the same funding shortage, but the Public Defender’s office was able to get some outside grants – one for $50,000 from the San Francisco Foundation and another for $25,000 from The California Endowment, according to Public Defender Robin Lipetzky. The money allowed her office to hire one legal support employee to work on Prop. 47 cases. So far, the county has received about 2,400 petitions. “We have been processing between 50 and 100 cases a week,” says Deputy Public Defender and Reentry Coordinator Ellen McDonnell. Kelly Emling, chief deputy with the Los Angeles County Public Defender’s Office, said that despite no additional hires, her office so far has been able to grant about 50,300 petitions. Thanks to her department’s partnership with a number of community-based organizations, outreach into the community has been good, although not as much as is necessary, she says. The Los Angeles County Board of Supervisors is likely to approve the hiring of a few paralegals to deal with Prop. 47 applications when it meets July 12, she said. In the meantime, Californians for Safety and Justice, in partnership with other non-profits, is continuing its outreach efforts to increase Prop. 47 applications. She worries that there may be homeless people who are not even aware of the law. The Los Angeles City Council backed a resolution Wednesday urging Gov. Jerry Brown and state lawmakers to increase the amount of funding proposed for drug treatment, mental health, re-entry and other services promised under Proposition 47. The measure, approved by voters in 2014, reduced six categories of non-violent felonies to misdemeanors and calls for using savings from locking up fewer inmates on preventative and rehabilitation services. The funds would go toward programs intended to help former inmates re-enter society, reduce the rate of individuals returning to prison and steer youth away from criminal activity. A portion of the funds was also allocated to services for the victims of crimes. However, a disagreement has arisen over the amount of those savings, with Brown estimating costs to be cut by $29.3 million as part of his January budget proposal, while others say that figure should be between $100 million to $200 million. The higher amount is based on the state Legislative Analyst’s Office’s projections when the ballot initiative was written, and more recently when the office released an updated calculation in February. The City Council, siding with the higher savings figures, approved a resolution by Councilmen Marqueece Harris-Dawson and Joe Buscaino that calls on Brown to reconsider his initial funding proposal. Before joining the City Council in 2015, Harris-Dawson was president of Community Coalition, a South Los Angeles advocacy group that actively pushed for passage of Proposition 47 as part of a statewide alliance called California Calls. Proposition 47 helped to reduce the prison population, which had grown so large that a judge had threatened to assume control over state prisons, but it is also important to ensure people do not return from prison or going there in the first place, according to Harris-Dawson. “You can save a little money here and go on the cheap, but those people are not going to go away if they do not get the services and they are not able to gain re-entrance to the community,” Harris-Dawson said. Karren Lane, vice president of policy with Community Coalition, said their group and other organizations are asking that the Los Angeles County Board of Supervisors also approve a similar resolution. “We’re encouraged our local leaders are stepping up to the plate to actually put pressure on the state to ensure that there’s enough resources in local neighborhoods and communities for prevention and treatment services,” Lane said. Lane said Brown’s figure, based on calculations by the Department of Finance, fails to account for savings from keeping fewer people in contract prisons, such as those located out of state. Under Proposition 47, the state had a year to calculate how much the state would save from releasing inmates and locking up fewer people. The first pot of funding is scheduled to be released in July and divvied up among local organizations and agencies that offer such services. Lane said there is a statewide push for Brown and other state officials to increase the funding proposal in the May revise of the budget and ultimately in June, when the spending plan is expected to be finalized. Updated 3/4/16 at 11:05 a.m.: Headline updated to reflect viewpoint of L.A. City Council. The Los Angeles County Board of Supervisors voted unanimously Tuesday to form a task force to help non-violent ex-cons update their records under Proposition 47 and to link them to jobs and services. Proposition 47 — dubbed by supporters the Safe Neighborhoods and Schools Act — was approved by 59.6 percent of California voters in 2014. It reduced some non-violent drug and property crimes — such as shoplifting, receiving stolen property and writing bad checks of less than $950 — from felonies to misdemeanors. Supervisors Hilda Solis and Mark Ridley-Thomas proposed the task force and Solis said it would bolster public safety. The task force will focus on connecting individuals coming out of jail and prison with jobs, housing, health care and mental health and substance abuse treatment and finding funding for those services. “For the last 40 years, our broken criminal justice system has drained communities like South Los Angeles,” said Karren Lane of the Community Coalition of policies that doled out harsh punishments for drug and other non-violent offenses. Solis highlighted the barriers faced by ex-offenders. “Having a felony conviction makes it difficult to get work, to get housing, to get services and to put your life back together,” Solis told her colleagues. Public Defender Ronald L. Brown said individuals in prison and jail suffer disproportionately from mental illness and substance abuse and told the board that treatment is critical to success outside of jail. “Prisons don’t encourage inmates to address their drug problems,” Brown said. Proponents say the proposition provides a more just penalty for low-level offenders. Anticipated savings from the law are intended to be spent on mental health and substance abuse treatment, truancy and dropout prevention and victim services. “I think what we’re talking about is a hand up, not a hammer down,” said Bruce Brodie of the county’s office of Alternate Public Defender. Other backers point to how Prop 47 has alleviated prison overcrowding and allowed more serious offenders to serve a greater proportion of their sentence. However, opponents say Prop 47 puts dangerous criminals who should be behind bars out on the streets. Supervisor Michael Antonovich pointed to criminals who are released only to commit new crimes, citing the example of one man who had been arrested 22 times after his initial release. “Violent crime is up 4.2 percent,” Antonovich said. Supervisor Sheila Kuehl challenged the idea that the proposition was linked to higher crime rates. 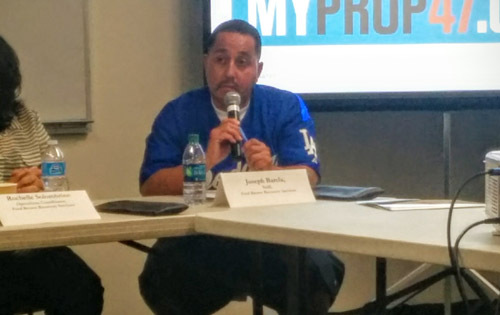 “There has been a lot of rhetoric about Prop 47 and a rise in crime rates and it’s just that, rhetoric. There is no data,” Kuehl said. Kuehl said San Diego County hasn’t seen a rise in crime since Prop 47 became effective. One community advocate said many of those eligible were unaware of the potential to change their lives. “Two out of three people who qualify for Prop 47 are not even aware” it exists, said Amber Rose Howard of All of Us or None. The task force was also charged with trying to extend the deadline to apply for a criminal record change, currently set for Nov. 3, 2017. The board directed staffers from the Office of Diversion and Re-Entry to work with the city of Los Angeles’ Office of Reentry to push for the region’s share of state funding from Prop 47 savings. A report back is expected in six months. The board also asked the Auditor-Controller to audit the county’s savings as a result of Prop 47.